Recently we have been experiencing an astrological grand trine in earth signs. Maybe that’s what inspired me to write a post on creating crystal grids. I really love crystal energy and I don’t know why I haven’t posted much about these powerhouses of magickal energy in the past, but a crystal grid can really enhance the energy of your magickal home! Earth is one of the five major energies that can be tapped into for manifesting your magickal wishes. This is a wonderful go-to book for the meanings and uses of just about every crystal! I love it! There are a lot of great websites that deal with working with crystals, too, and I am by no means an expert on working with these “gems”. There is always more to learn where crystals are concerned, but don’t be discouraged thinking you don’t know enough to use their wonderful power. A simple grid set up in a place where you will see it often will suffice to bring about your magickal intention! I keep a crystal grid set up continuously on my ancestor altar around a candle. My ancestors in spirit are my guardians and I honor them at all times. I have two pieces of selenite that are shaped like angel wings and I arranged them on either side of the candle. I also have some heart shaped stones that my husband and I collected that I like to include. Green and pink stones for the heart and higher heart also seem to fit in this grid and I use quartz crystals to further enhance the energy. Do you see the possibilities for working with crystals? By adding their energy to candle work, herbal charms, or any other type of energy work you are making a good thing even better! I have been collecting crystals for years. Some I have purchased and others were given to me as gifts. When you receive a crystal, always remember to clear it. My favorite ways to clear a stone are by running it under cold water, smudging it or holding my hands over it and sending energy into the stone with the intention of clearing old energy that will not benefit me. I also like to then charge the stone to work for my magickal intentions. At the full moon I like to set my stones out in the moonlight to recharge them. After deciding on your intention, gather the crystals, the cloth or other base you are going to use and any candles or figurines you will use for the center of your grid. Start in the center with your central figure and then place the crystals around the center in a pleasing pattern. I always feel that your intuition should guide you in the crystal placement. When you feel everything is in place, hold both hands over your grid and charge the crystals to give off the desired energy. If you want to say a charm or prayer over your grid, that would be great. Leave the grid in a place where you will see it at least once a day. When you do visit your crystal grid, visualize all the positive results that you desire from its work. Don’t focus on what you lack or bring any worry energy to the grid. Just be calm and positive that all is well! Be sure to thank the stones and other energies you are working with while the grid is set up and when you are ready to disassemble it. This grid is calling on Ganesha to remove obstacles (because that’s what he does!) from achieving financial prosperity. 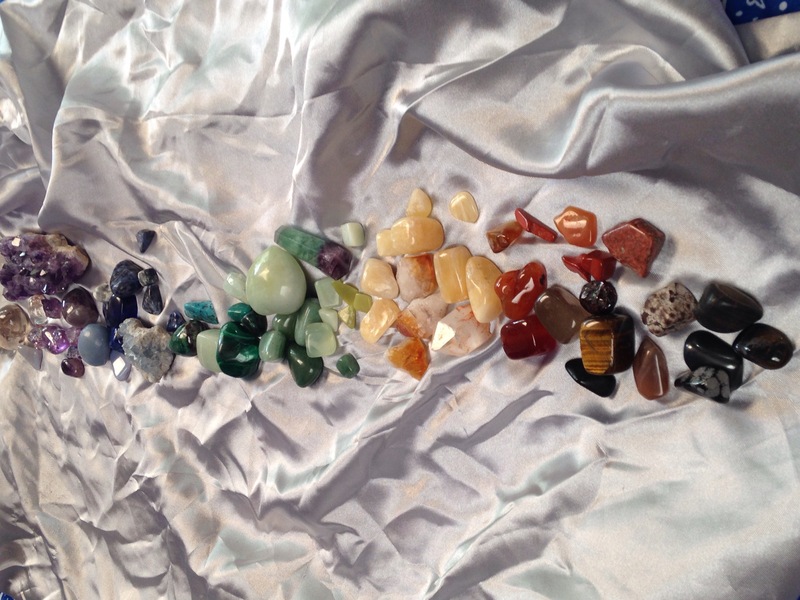 The citrines are orange and clear money magnets, the green malachite and emerald and other green stones are for wealth and those clear quartz crystals are radiating the energy into the environment. In back of Ganesha there is a copper ball and piece of copper (metals are also $). I chose a gold plate as a base for the grid and set the grid on a red table cloth, because Ganesha just loves red! The following grid calls on Kwan Yin, the Goddess of Compassion. Have there have been lots of arguments and disagreements in your home? Have you been needing to show a little compassion towards yourself? If so, call on Kwan Yin. Rose quartz is associated with her and the energy of compassion. Green stones are for the heart and healing. She is on a pure white background, symbolizing the purity of her love and, again we have some quartz crystals to radiate that loving energy into the environment. 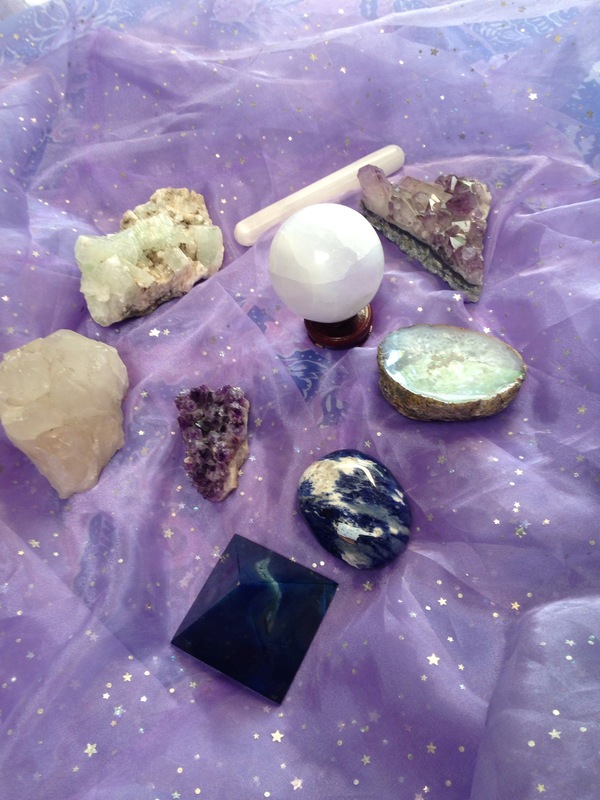 This final grid is using an amethyst candle holder and several spiritual, higher chakra stones to tap into the astral planes. This would be a great grid to use in meditation. This time I used some flat ended quartz crystals aimed upward to send out a beacon to the higher realms. I set it all on a piece of star studded fabric in a very magickal purple color. I lit the candle in the holder as well as some incense to create a wonderful, simple crystal grid for meditation purposes. I hope you enjoy exploring the magickal world of crystals! At the full moon I may set up a grid to be charged in the moonlight to bring in even more magickal energy. Then there is the idea of a garden grid, or a fairy grid, or a new moon manifesting grid……..the possibilities are endless!! I love collecting crystals. Just looking at them and holding them seems to evoke feelings of wonder and magic. Your suggestion of creating a crystal grid for a particular purpose is a wonderful idea. I will have to try it! That’s great! Please let us know your results!